Provides high protection from UVB and UVA radiation; transparent zinc oxide enhances and extends protection in the UVA spectrum; an excellent base for makeup. 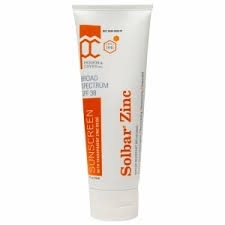 Apply SOLBAR ZINC cream liberally and evenly to DRY skin, 15-20 minutes before sun exposure and massage in gently. Reapply to DRY skin after prolonged swimming, outdoor physical activity, excessive perspiration or towel drying. Dermatologists recommend reapplying sunscreen during prolonged sun exposure every 2 hours. There is no recommended dosage for children under six (6) months of age, except under the advice of a physician. For external use only. Not to be swallowed. Avoid contact with eyes. Rinse thoroughly with water if contact occurs. If irritation or sensitization occurs, discontinue use and consult a physician. Keep out of reach of children. In case of accidental ingestion, seek professional assistance or contact a poison control center immediately. Purified Water; Isobutyl Stearate; Glyceryl Stearate; PEG-100 Stearate; Glycerin; Glyceryl Dilaurate; PVP/Eicosene Copolymer; Dimethicone; Cyclomethicone; DEA-Cetyl Phosphate; Stearyl Alcohol; Steareth-20; Cetyl Alcohol; Benzyl Alcohol; Citric Acid; Xanthan Gum; Disodium EDTA"